I use to say that the best sunrise can be seen on a beach because of the magical reflections of the golden rays on the sea. But then, I have never been to Sagada before. Now, I am having a second-thought about my statement because sunrise in Kiltipan is somewhat a mesmerizing experience. Kiltipan is one of Sagada's highest points. To catch the sunrise, we woke-up at around 4 in the morning and boarded a jeepney we have hired the night before. The jeepney ride last for about twenty-minutes on an uphill, unpaved road. We eventually stopped at Kiltipan Viewdeck and prepared ourselves for the sunrise. At five o' clock in the morning, the entire surrounding is still pitch-black but in just few minutes more, as the first glimpse of rays arrive, and as your eyes get acquainted with the dark, you will be awed with the sea of clouds enveloping the land and mountains below. And as time passes, the hues of sunrise mixed with the images of the mountains will just take your breath-away. Well, enough talking, here are some shots I have taken that one great morning in Sagada. Let me share this post to my friends at My World. To see other amazing places, please click here. That was a magical journey. The rays and the clouds in the valley were really true wonders of the world. That was an other worldly and magical journey, as chrome commented above! What incredible beauty! Your photos surely light up a dark night! Thank you! the view is worth waking up early for. Wow, i'm fascinated. Never been to Sagada. Thanks for sharing. :D i've been to Sagada myself but never been to that particular place. Personally for me, sunrise or sunset seen from a mountain is the best. The next best thing is the beach. Galing ng mga kuha mo! love them all! this is so worth waking up before the roosters do! wow that sure was stunning! i'm speechless! what a breathtaking sunrise! these photos are so beautiful, they make me long to see the sunrise again. WOW. nature at its best! shet ang ganda. sa lawak ng kabundukan may lalim ng kapatagan..gandang espasyo ng kuha...lumulutang sa hangin! This sunrise was well worth getting up early for, your photos are amazing and so colorful. Being up in the clouds must have been a neat experience. wow, nice sunset photos. i particularly like the Sea of Clouds and Fogs. 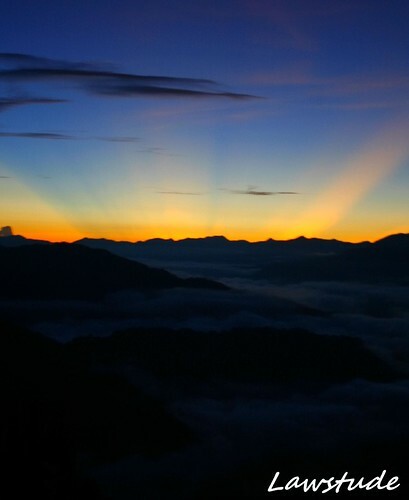 wow i've never enjoyed sunrise so much before... ngaun lang... it was so MAJESTIC... ganda... breath-taking... lahat na!!! never pa akong nakakita ng sunrise sa tabing dagat. bihira lang ako makakita ng sunrise, sa taong ito, twice pa lang. maganda ang pakiramdam habang nag aabang lalo na kapag makakita ng magandang sunrise. Great shots indeed! great view bro! that's something i missed when i was there. giving me enough reason to go there again. The skies seen from there are magical! indeed! this is way better than the view from Manila Bay! I always thought when i was a kid that a sea of clouds was only camera trick. nice photos. how long is the travel from bagiou city to sagada? Wow I love the photos. The rays that appearing and the beautiful and rich colour of the sunrays. And the clouds are so heavenly. Very beautiful. Oh Wow. I won't mind waking-up that early to enjoy the sight. wow! breath taking shots. na-amazed na naman ako. Guys! Long weekend! November 27-30! The world is truly amazing.